Online proof-reading tools come handy when you need to quickly check grammar, spellings mistakes, word usage, vocabulary etc. in your papers, blog posts, emails and documents. You can also check for plagiarism and originality of your text. These tools are best in checking and correcting English grammar and spellings. If you want to be a successful blogger it is important that you write your posts in correct language. No matter which language you use in your blog, your posts and documents must not contain any spelling or grammar mistakes. Therefore, it is highly recommended that you thoroughly proofread text and check grammar before posting it online. Proof-reading should actually be a habit as it makes you a better writer. Although sometimes people feel irritated when MS Word shows all those red green wavy underlines to mark spelling and grammar mistakes, but it is in your interest that you remove all the proof related errors from your content. 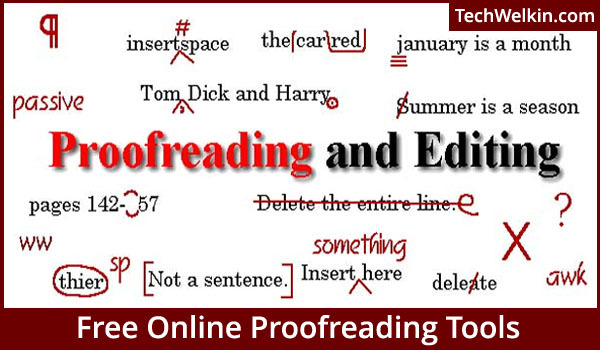 Top 10 Online and Free Proofreading Tools. There are several free online proofreading tools and website services that can help you in checking your post content. Let’s take a look at the top 10 free online proofreading websites and see how good they are. Before I begin with the top 10 free and online proof-reading tools, let me tell you that MS-Word is obviously the world’s most used proof-reading facility. It is quite powerful in finding spelling and grammar mistakes. MS-Word supports a large number of languages including Hindi and other Indian languages. Not only it marks the spelling and grammar mistakes for you to review, MS-Word also provides facility of auto-correcting the often made errors. To use MS-Word, you would not need to have Internet connection and you can easily save your work in your local computer. But there is one thing I don’t like about MS-Word. It automatically changes the plain quotes with smart curly quotes. So, when you copy text from MS-Word and paste it in your blog post, instead of plain quotes, what you get are the curly quotes. I personally like plain quote marks, but it is just a matter of personal preference. There is no real drawback or advantage of either. There are a lot of free online proof-reader tools —some are good, and some are not-so-good. I am presenting here the top 10 of these tools based on my experience. Grammarly can be installed as an extension in your web browsers like Google Chrome, Firefox, Safari and Internet Explorer. It is also available as a plugin for MS-Word and MS-Outlook. 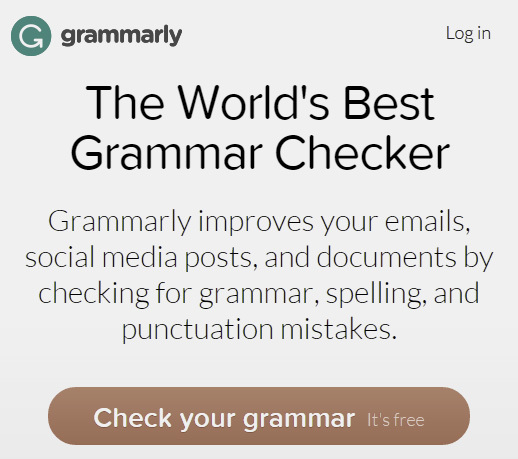 The tool makers claim that Grammarly checks your text for more than 250 grammar rules. Needless to say, it can also check spellings. 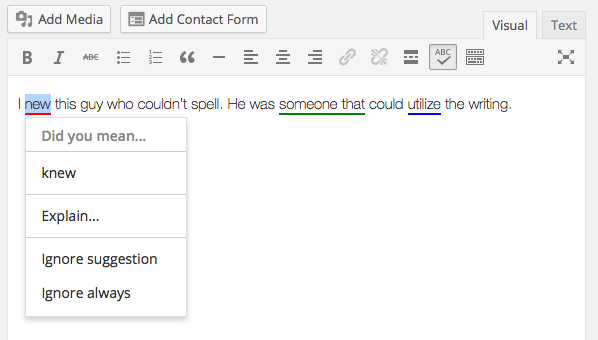 Grammarly can detect if a word is spelled correctly but has been used in wrong context. Going even further, Grammarly will make suggestions to enhance your documents vocabulary by suggesting better words as replacement, according to the context. Because Grammarly works as a browser extension, everything that you will type within your browser will be automatically scanned for grammar and spellings. As a result, you’ll be able to make Facebook posts, publish blog posts and write emails —all without any grammar or spelling mistakes. Grammarly provides a plagiarism checker feature as well. As I have been constantly telling all the bloggers, copying material from anywhere on the web is the worst thing you can do to your blog. Plagiarism attracts heavy penalty from major search engines like Google, Bing and Yahoo!. Sometimes, however, your content may have unintentional similarities with another webpage. But search engines will not be able to distinguish if this similarity was intentional or not, they will all the same put a penalty on your website. Therefore, it is important that you check your posts for plagiarism. WordPress also provides in-built proof-reading facility through plugins. Google has been developing online office tools under the Google Docs project, and they have succeeded in creating very useful products! Lately these tools have been shifted under the Google Drive. Among these, a word processing tool is also available. It works on the lines of MS-Word. And thus provides the proof-reading features as well. Proof-reader facility in Google Docs is very powerful (after all it’s Google’s project!). The added advantage is that your document gets saved online in Google Drive. As a result, you’ll able to access and edit your document from any computer in the world. 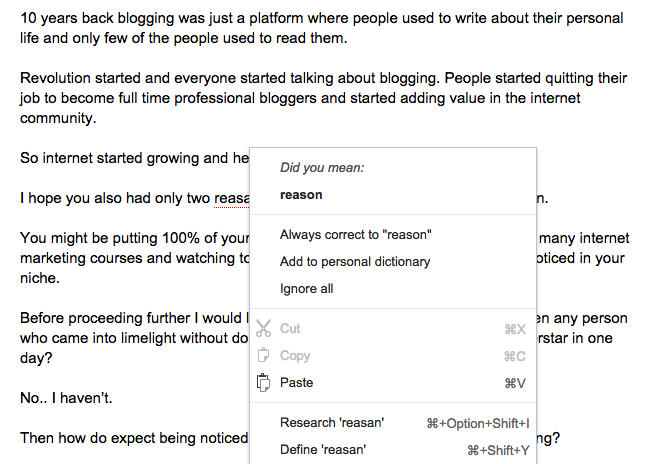 Screenshot showing proof-reading feature in Google Docs. Google Docs also allows a lot of add-ons. In addition to the in-built proofreading features from Google, you can extend this functionality by using suitable add-ons. For example, Consistency Checker is an add-on that will check consistency of word usage in your document (like, US and U.S. ; in-line and inline ; color and colour). If you do not want to install any plugins in your browser and just want to proof-read a piece of text by copy-pasting, then PaperRater is a good tool for you. It is a website based tool. You go to PaperRater website and paste the text you want to check. PaperRater gives you report on spelling mistakes, grammar mistakes, suggestions on word choice and style of writing; and a plagiarism report as well. This tool works even better for proofreading research papers. When you submit text, PaperRater actually asks you about the education level of the writer and then it checks the text on the basis of your input. PaperRater can specifically proof-read different types of documents; e.g. resume, biography, lab report, essay, thesis, speech, letter, research paper, review, short story, business communication and personal diary. PaperRater can also check for the originality of your content (originality is an extremely important aspect in research papers). 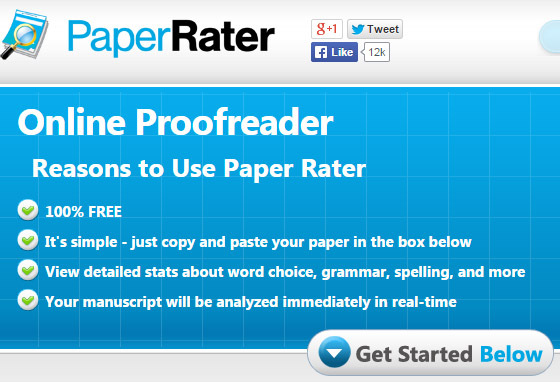 PaperRater is an online proof-reading tool for research papers and other similar documents. “Make No Mistakes” is the punchline of Ginger online proof-reading tool. You can install Ginger proof-reader as Google Chrome extension or MS-Office plugin. It is also available for iPhone, iPad and Android devices. In addition to grammar and spelling check, Ginger also provides some more interesting features. It has an in-built sentence rephraser, a tool that can suggest you different ways to write the same sentence. Ginger also has in-built dictionaries and text-to-speech (TTS) modules. TTS can read out the submitted text. Moreover, Ginger also offers a Personal English Trainer module that helps you to test and better your English language skills. 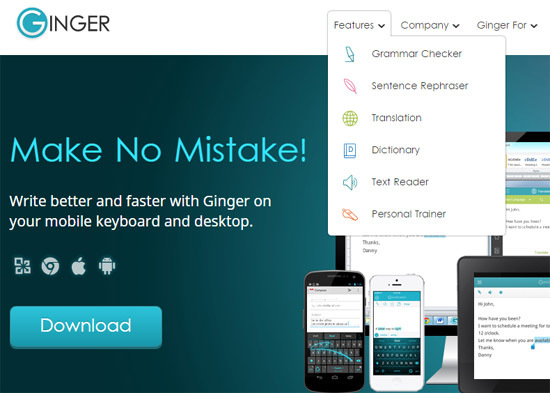 Ginger provides several online language tools including proofreading. After the Deadline is a tool that is based on open source technologies. The developers have made the service available through several methods. After the Deadline has a WordPress plugin that you can install on a WordPress website or blog. Developers have also created After the Deadline extensions for Chrome, Firefox and Windows Live Writer. This service is available through many other platforms. After the Deadline is not available as a plugin for MS-Word. If you don’t want to install any plugin and just want to do a quick proofreading, the developers have created a simple web interface at Polish My Writing. On this webpage, you can simply copy-paste the text and ask After the Deadline to do the proof reading. 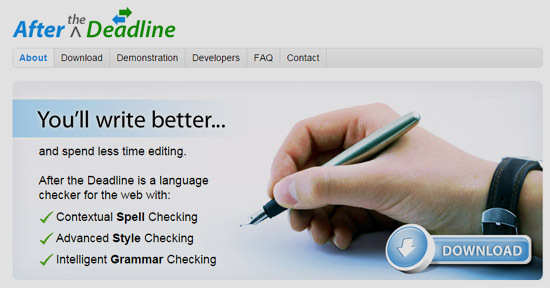 After the Deadline is an open source online proofreading facility. Slick Write is a very simple web interface. It helps you in making sure that your documents contain no grammatical errors. The thing I really like about Slick Write is that its interface is very clean but still it is a power-packed tool. After analyzing the text submitted by you, it shows a good deal of useful information about the text. For example, it will show flow related information (structural flow, sentence length flow and word length flow) for various sentences and phrases in your document. Slick Write gives you statistics like how many function words, adverbs, pronouns and uncommon words have been used in your document. Slick Write website also has a word association game to help you develop new and creative phrases! ProWritingAid gives you all this, and more, besides the regular grammar and spell checking. However, not all the features of ProWritingAid are free. ProofHQ is not entirely free proofreading service. But it provides a 14 day free trial in which you can use and test the ProofHQ features. It provides a platform for collaborative writing. Team members can track changes made in a document. This proofing and document management tool is very useful for those who are into professional content development. If you’re looking for a similar but completely free tool, you should consider Google Docs, which I mentioned above. Google Docs also provides features that allow concurrent editing and version management of a document. ProofReadBot lets you paste text and then it checks the text for all sorts of grammar and spelling mistakes. This tool is a bit slow in doing proofreading but it produces a comprehensive report on all the errors and suggestions related with the proof of your text. With the help of technology, it has become pretty simple to do all the basic and advanced grammar checks on your text. Above I have listed the top 10 of the free online proofreading facilities. I would suggest that you try all these websites and see which one provides you the results that you’re seeking. None of these tools is perfect. They all have their own advantages and drawbacks. Requirements of every user are different. Therefore you should select a tool that suits you the best. Importance of proofreading and posting correct error-free text can not be overstated. You must make efforts to remove all the grammar and spelling errors from your posts, documents and papers. Bad language gives a very bad impression. Make sure you present the perfectly crafted document to your users. Useful information for linguists and others who wants to improve their language skills. Thank you for this compilation. great research bro. Can you kindly suggest some more listing? Thanks Lalit! Loved the post. I’ve been been writing for 10 years already and proofreading is really hard thing and sometimes I don’t have time to do it by myself and I use some websites for help and it’s really rescue tools. Most frequently I use Ginger, WordPress Proofreading and Unplag plagiarism checker instead of Grammarly, it’s cheaper, but equally well (if no better), at least it does everything what I wait from plagiarism checker. It doesn’t save or share my files, it’s fast and simple in using. Try it, I believe you’ll like it. But still thank you a lot for the post, I’ll try other tools from your list, hope I’ll find something better. Where is whitecloud on this list. Is it any good or just so-so? I could not find how to subscribe to Grammarly online. I would love to try it for a week or so and then really decide. I do not like the idea of paying for a whole year. Is there a way to pay for a quarter. If so then send me the website. Yes, Rungroj, online proofreading tools are very useful for researchers, students and teachers alike.